Friday has come back around once again and that means Fab Fifty Friday has come along with it. People say thank god it’s Friday, I say thank god it’s Fab Fifty Friday. The outfit I created is perfect for spring. Now is the perfect time for you to be searching in the clearance racks for spring clothing, that way you already have the clothes for a cheaper price compared to buying something for spring that costs a lot more than what you could get now. Some people think that the clothes put in clearance racks are out of style, but if you are able to play with the piece right, then you can create a very impressive outfit. Sometimes I have found most of my timeless pieces in the clearance racks. This outfit works because the necklace and the dress are eye-catching and vibrant so combining it with the faded turquoise shoes and tights attract more attention to the main piece, which is the dress. The denim jacket is great because even if you put it over the dress, we can still see the vibrant colors and it won’t take the attention away from the dress. This outfit can show the artistic side of a person because of the cool colors and the interesting patterns that are used. Everywhere I go people are talking about the movie Frozen. The song “Let it go” has been a huge hit among us teenagers. I went to Pandora to create a Les Miserables station and after a few songs from the actual musical, some songs from Frozen started coming on. Frozen merchandise is everywhere. I found a giant Olaf at one of the stores for five hundred dollars. I have to admit I wanted the giant Olaf to keep in my room, but it is not worth five hundred dollars though. I went to see Frozen a few weeks ago because I got tired of people saying how much they loved the movie and I had not been able to see it yet. The movie was great, it showed the power of love in some of the most unexpected ways. It also shows how important it is to show love to your family members because they are some of the closest to you, and no matter what they will always love you. The movie teaches young girls multiple life lessons. I have learned to appreciate the people in my life and to keep them as close as I can. I decided to make an Elisa inspired outfit because I thought her singing was great and her character was strong. Elsa transformed into a long blue dress in the beginning of the movie while creating her ice castle and singing “Let it go”. I used a short blue dress because it was a better fit for a teenage girl. I also chose ice blue shoes and a purse because Elsa did have ice powers, therefore making the color appropriate. The reason I chose to use jewelry with blue and silver crystals is because, with the earrings it looked like you would have crystals hanging from your ears. I love the colors in the jewelry because; I bet when the light hits the crystals, they will sparkle like snow does. 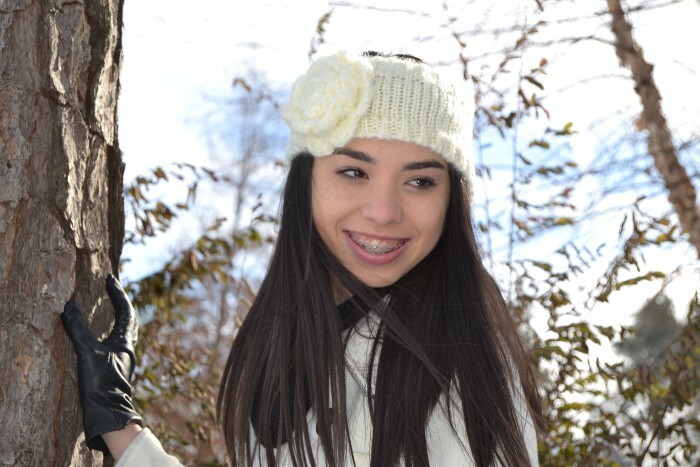 I feel like I am more like Elsa in the movie because I am always serious. If you touch me I’m always cold, I’m head strong, and I do truly love my sister and would do anything for her. If you have seen Frozen, which character do you feel like you relate to the most? As I have mentioned before I live in Atlanta (the south of the United States) where snow is very rare, so when it does snow here everybody goes sort of crazy. We were hit yesterday with a snow storm that brought to the area between 1 to 4 inches of snow. You might think that is not a lot (and it is not) but the state was not ready for it. The schools didn’t cancel classes which caused an even bigger chaos. People got stranded in their cars on the interstate for over 12 hours, a woman had a baby in her car and hundreds of kids either got stranded on their buses in the roads or slept at their schools. I guess I was one of the “lucky” ones as it only took me 5 hours to get home. Waiting on the bus was particularly stressful, some of the kids jumped out the windows and ran home. Trees on the road, car accidents, and my bus getting stuck in a ditch all caused me getting home late to a frantic mother. A police officer from the Sheriff Department finally brought me home. I was so grateful. 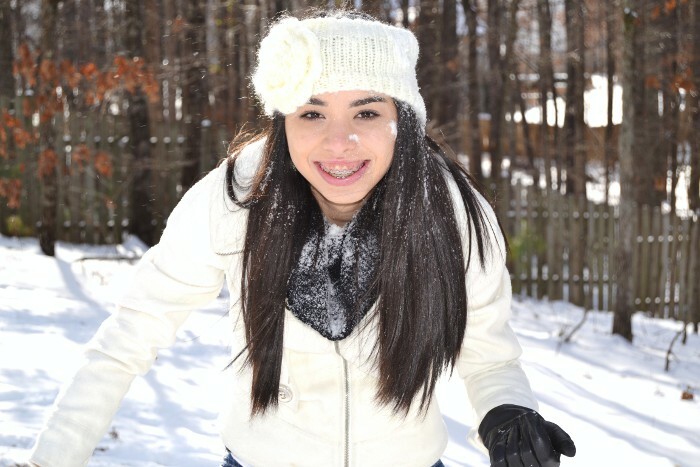 As any normal teen would be, we were all very excited because of the snow but I was especially excited since I had never experience snow before. Today was a snow day and tomorrow there is not going to be any school either. I was so cold yesterday that I didn’t really play in the snow, I was tired and just wanted to be inside. Today my sister and I pretty much spent all day outside. We tried making a snowman but that didn’t work out. It was still fun, we sang “Do you want to build a snowman?” from the movie Frozen while we were trying to build it. We used our boogie boards to go sledding down our driveway which is a small hill. My sister would sing “Let it go” as she would go down. 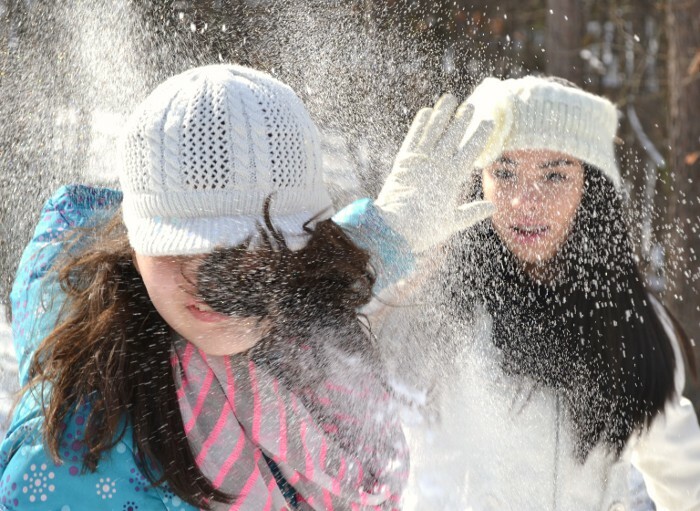 We tried making a few snowballs, but we had gloves on so it was hard to pack it. I must admit that for my first time seeing snow, I had lots of fun looking at its beauty and playing in it with my sister and my mom. To warm up my sister and I made hot chocolate and popcorn to go along with our movie Mulan. Have you ever been stranded in your car due to weather? I like to check up the magazine covers when I go to the grocery store. 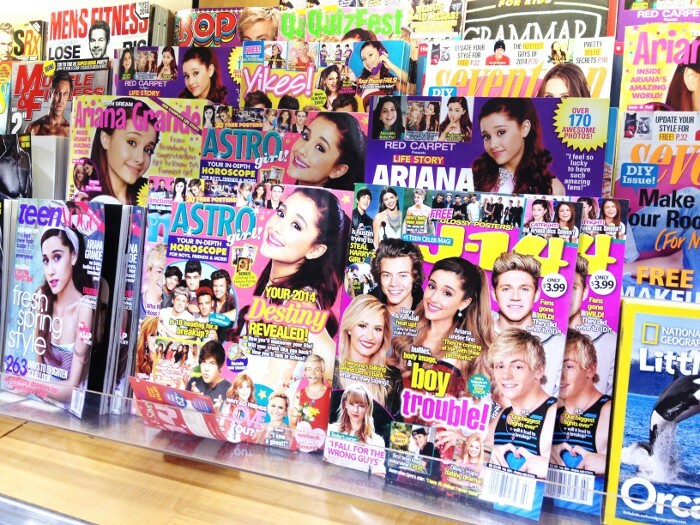 On my last trip I couldn’t help but notice that Ariana Grande was at almost each cover of the teeny bopper magazines (that is what my uncle calls me). She even made the cover of Teen Vogue! I thought it was very peculiar the notoriety she gained after her hit The Way. I think she is certainly very talented and sounds a lot like Mariah Carey. I’m not a huge fan of hers but can recognize that she has become a role model for multiple girls out there and has inspired many more to follow their dreams. She has definitely come long ways from Victorious to Ariana Grande, the star. I am sad to say that this is the last outfit of the series, but happy to inform that this is the first series to many more. So far in this series I have used two outfits using silver, one outfit using a metallic blue, two gold outfits, and a copper outfit using some rose gold in it as well. This last outfit is a greenish bronze metallic color. When I first saw the shirt my mind started thinking military inspired, therefore I did. I used a military printed pant, but instead of using the different shades of green I used a pant that had light blue to add some unexpected color to the outfit. I used the gray heels because they had a really cool pattern which went well with the military print. The gray was part of the color palette I was trying to keep. The flats are a light gray which still goes with the rest of the colors in the outfit. The accessories had a dark military green which was in the shirt and pants and had a military sort of design. The purse had the dark green as well with the khaki that are both found in the pants. You are now ready to command those metallic colors like a general. So, at ease! I don’t know anyone in the army but I still respect each soldier like the heroes they are. A shout out to all our troops! We are coming close to the end of the metallic series. Even though I have had lots of fun creating these outfits, I am ready to start doing new outfits for different inspirations and hopefully do more series such as this one. So far I have done a lot of gold and silver and I just want to break away from those two colors. For this outfit I decided to use a copper color and go a little more bold with the metallic instead of a smaller piece such as some shorts or a jacket. Wearing metallic colors is like having a spotlight shine down on you the whole time you wear the piece. The more metallic you wear (as long as you know how to use them right) the brighter that spotlight will shine over you. I added the copper dress and created an outfit around it with more toned down colors because the dress is already bright enough. This dress is very versatile, the sky is the limit when in comes to mixing and matching this dress. I decided to use black and some lighter looking metallic. The black blazer breaks up all the copper at the top. The heels I used for this dress have rose gold and silver which went amazingly against the black background. I used a black and gold sandal because the design was eye-catching and made the outfit look elegant. All the accessories have black and rose gold in them which keeps everything on the same color palette. I used a rose gold and black belt over the copper dress to add even more flare. The purse has a light pink (like a rose gold without a shine), gray, and black which still sticks to the color palette. Sometimes it’s harder to make a bold step but it does pay off once people see you in it. Have you ever worn something that you weren’t sure about but once you wore it you felt amazing in it? What was it? I’m back with the Metallic Series that I interrupted because of FFF (Fab Fifty Friday). Recently I have done two outfits with gold, a silver outfit, and a metallic blue outfit. I love the way metallic look, especially when you stand in the light and all you can do is shine and look glamorous. Plus I’m the type of girl who likes attention, a metallic piece of clothing attracts that attention I’m looking for. I decided to use a silver short for this outfit to make it a bit more casual. When I saw this shorts, all I could think was I need them! I have lived in warm climates all my life (14 long years), over the years I have come to appreciate shorts and how they keep you cooler. Along with the shorts I added a purple tweed blazer to go on top. I chose this blazer because it has some silver details in it and since it is mostly purple it tones down what could be a shocking silver look with the shorts. The addition of the blazer makes the outfit more elegant and gives unity to the look. The shoes are purple with little details on the front to add some fun to the outfit. The purse is purple as well and it has a cute paisley print which adds some variety. The jewelry is all silver and purple which ties up everything into one piece. I love how purple and silver go together. I love that color combination so much that my room is full of purple, silver, and white. I can see that growing a teen fashion blog requires lots of dedication and patience. Although I blog because I really enjoy putting outfits together and sharing them with everybody the truth is that I’m also looking to gain followers, not for egotistical reasons but in hopes that a college will notice me and offer me a scholarship. Followers are not coming as fast as a 14-year-old teen would like which can be a little disheartening. The silver lining of the week was that I was chosen as one of the “Brilliant Blogger Set of the Week” by Polyvore.com for my Silver Rights Movement set, which was super exciting and brought a couple of visitors to the site. Only two more metallic sets to go for this series. Hoping you are enjoying it as much as I am.